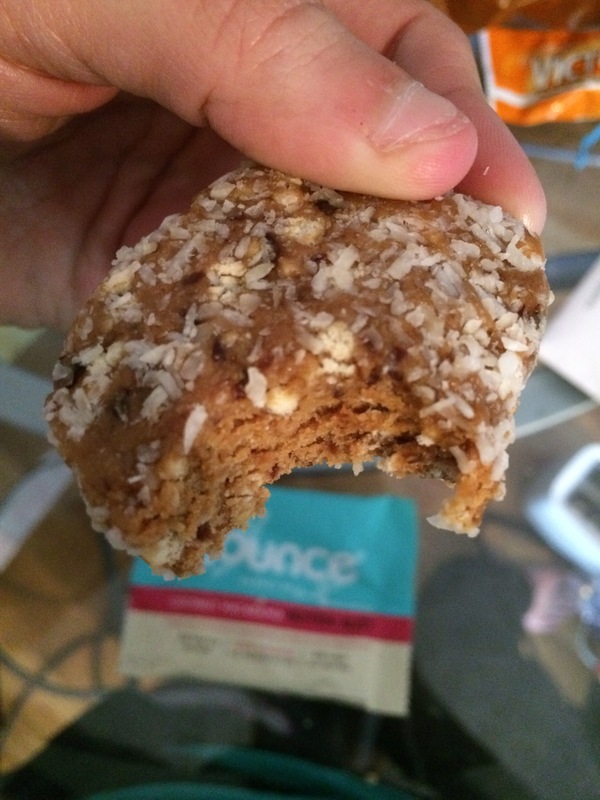 I was told by a commenter on Instagram that I should try Bounce Energy Balls as a protein bite/bar. I won’t lie, I was a little skeptical at first because I want to make sure that my protein is going to fill me up and keep me full for longer than 15 minutes. The Bounce Energy Ball is about the size of a ping-pong ball, so at first glance I wasn’t too sure. However, if it says it’s a good flavor I will probably be enticed to buy it. I found coconut macadamia protein bliss in cacao mint protein bomb, with names like those I really couldn’t pass them up. Tonight as I was making dinner I had some room in my macros for a snack, so I dug through the pantry to find something new that I hadn’t tried before. I came across the coconut macadamia protein bless ball and figured why not. So again, at first glance you’re not so sure how good this ball will be, and mine wasn’t exactly a ball (see picture above). Though, the amount of coconut that cover this ball definitely intrigued me because I love coconut everything. 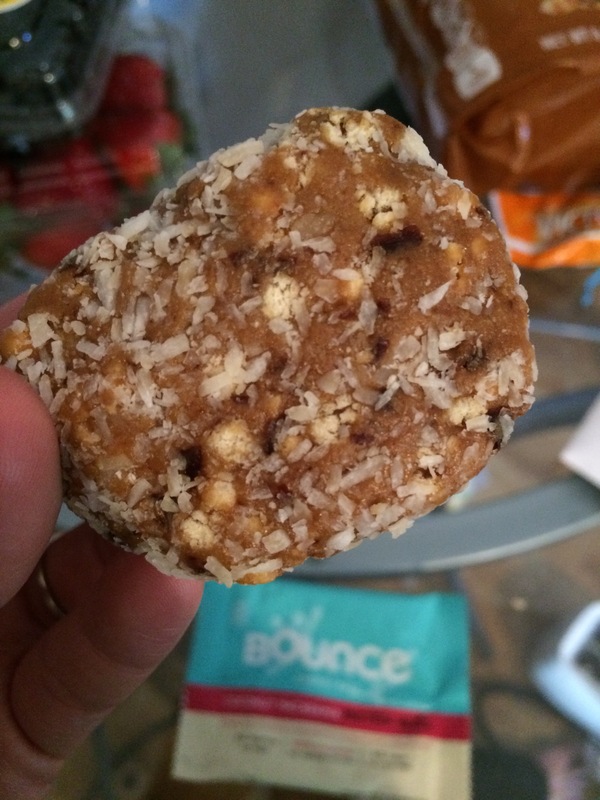 This ball tastes is as if a KIND Bar and a coconut macaroon decided to get it on at a party and made little bouncing balls. It’s chewy like a KIND Bar, but the shredded coconut gives it something extra. I found these at Vitamin Shoppe and I haven’t looked for them anywhere else. I definitely recommend to anyone who has no idea about protein snacks or treats to find them and give them a whirl. I also recommend buying individual bars whenever possible so you can try different flavors of bars. You never know which bar you will live or hate and it would be a waste to invest in a box of something you won’t eat. I can’t wait to try the cacao mint protein bomb next! Has anyone found any ther flavors of these before that I should search for?